EZ-Light is a worthy replacement for conventional indicators and devices, and provides process refinement, as result ensuring error-free assembly and greater levels of productivity. The sensors provide real-time operational status to workers and supervisors, who can take appropriate action in time. Their compatibility with PLC and other logic level control outputs means they can easily integrate into an automated system, which as a result improves plant flow, efficiency and productivity. The lights can be seen in action in a variety of applications and industries. One such industry is assembly and manufacturing where the goal is to improve flow of components from the sorting area to the work stations. The automotive sector serves as a prime example of such an industry where challenges such as distance between workstations and ambient light interference are rampant. The EZ-Light Touch K50 along with TL50 tower light provides a permanent solution. In this application in particular, aluminum components are to be loaded onto a conveyer belt that transfer it to a large oven. The oven would carry out heat treatment cycle, after which the components would be remoted, sorted and transferred to the workstation. The problem arises when an increasing number of components pass through the oven, making it difficult for the system to keep up with the pace. Congestion starts to build, leading to problems such as misdirection and damaging of equipment. The standard procedure in such a situation is to pause the flow of parts and solve the issue, however the distance between loading & unloading areas makes it difficult for operators to respond in time. An EZ-Light Touch K50 button can be installed at the unloading station. The installation is easy, and all that’s required is couple of brackets and wiring. On the loading side, an EZ-Light TL50 tower light can be installed to illicit the response sent by K50. 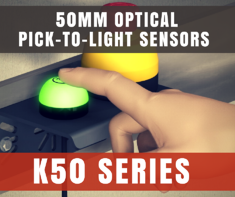 So, when the unloading operator depresses the K50 sensor button, the tower light illuminates, signaling the loading operator to halt. Pressing the button again changes it to green, signaling the operator to resume operations. This ensures clear communication, and reduces downtime due to confusion or false restarts. Through such an implementation, coordination between physically separated operators can be reduced, and operations can be streamlined, as per the original design. Interested in learning more about Banner Engineering products?